I make a living from painting houses and doing handyman work. But i haven’t had a job in weeks. This time a year is always a quiet period, but i cannot remember having so little work for so long. Luckily i have some small jobs for the next two weeks: half a day painting here, building a wallcase there, repairing some old windows, it could have been a bit more, but i am happy to have work at all. Last week i built a bookcase for people who live two streets awau from our place. Not an easy job, because one side of the case is angled. (Is that how you say this in English? 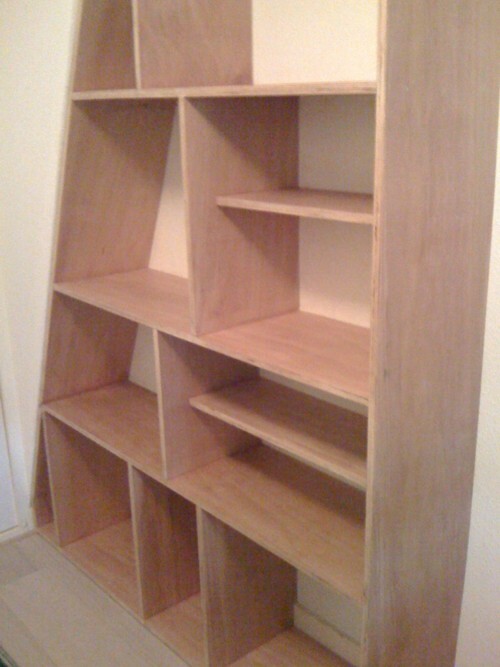 )I prefer to built with MDF; that is easier, because you can camouflage the mistakes with paint. This case was not to be painted, so i had to work very carefull. Since i now have a camera, i will try to make photo’s of some of my real work. The wood cost 212 euro, i spent eight hours on the case, so that is another 200 euro. A lot of money for a bookcase, but the people were happy and asked me to built another bookcase next week. It is funny that some people only know me as a house painter; they have no idea of all the art and writing that i do. And the other half of the people that know me, have no idea that i work as a painter/handyman. But is quite a good combination. I never mind when i have no jobs, i enjoy sitting home to write and draw. And of course, i also have comics to letter every now and then. Actually, i have nothing to complain.